A robust bread that will not last long. 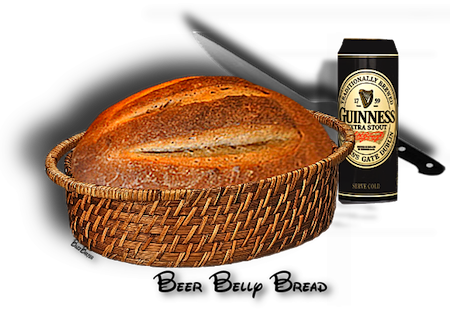 The beer gives the bread a tanginess that just makes you ask for more. • 12	ounces Guinness extra stout beer or a favorite dark beer. 1. Combine the sifted flour, sugar, baking powder and salt in a large bowl; blend well. 2. Pour in the sour cream and beer and mix thoroughly but do not beat mixture. 3. Grease a 2-1/2 quart baking dish or 10 inch round baking pan. Preheat oven to 350°F degrees. 4. Pour mixture into pan and bake for 40-45 minutes. or until browned and sounds "hollow" when tapped. •Serving Ideas:	Serve with chili or baked beans. 1. If using self-rising flour, omit the baking powder and salt.